Chronicles of Zostera: Wow its been a while!!! Wow its been a while!!! Sorry all. Summer is my busy season, and while I have been snapping lots of photos and working on my research, I have not been very religious in my postings. I will try to do a better job from here on out. So, some good news, I have my second manuscript accepted for publication in Marine Biology. I still need to make some minor revisions, but that was still very exciting. My abstract was accepted as an oral presentation at the upcoming CERF meetings in Portland, Oregon. I am trying to save money for a diving trip to Fiji this January, where while I hope to participate in many fun dives, I also hope to do a research project involving seagrass meadows there. 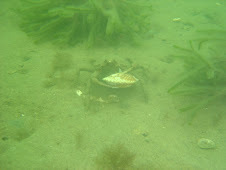 But onto the current research- we are seeing larger scallop sets this year than all the previous years combined. In 4 spat collection dates, we have already collected over 30,000 seed scallops. That may not seem like many, but its more than the previous 4 years of monitoring combined. This seems to indicate that the multiple spawning sanctuaries we have set up are working, and in past years may have seeded pockets of spawning individuals in other portions of the bay. 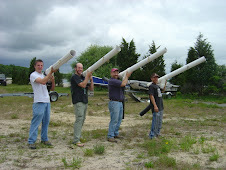 This is good news for bay scallops and Long Island. However, I must not be to quick to celebrate, as there is a lot that can happen between now and November 2010, when this years scallop set will be old enough to harvest. This is also good for my actual research, one aspect of which is examining the roles seagrass patch architecture might play in recruitment, growth and survival. While I have been working on the recruitment and growth aspects of this project, but I had not been observing recruitment to my mats. This has changed this year - likely a combination of a slight change to my recruitment collector design and the apparent increase in larvae in the water column - I have collected ~700 scallops on my artificial seagrass units. This was very exciting. In my two collections thus far, there seems to be a natural experiment going on - in three weeks, the collectors went from an average of 124 per square meter to 56 per square meter - a 50% reduction in a 3 week time frame. This is likely due to predation, but I will have a better idea in the next 4 weeks when I have 2 more collections. This was all very exciting to me. Even more exciting, is that in addition to seeing scallop seeds set on eelgrass, we are also starting to find scallops set on species of macroalgae. 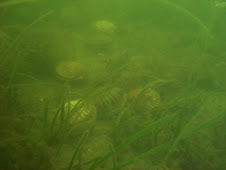 This will hopefully start to shift some of the old ideas that only eelgrass is suitable for bay scallops, because we are observing in the Peconics scallops in and on many other potential habitats! Lots of exciting things. Stay Tuned!